This Standing Witch with Red Apple decoration looks like something from a fairytale but once you hear her cackling voice it will be more like a nightmare. 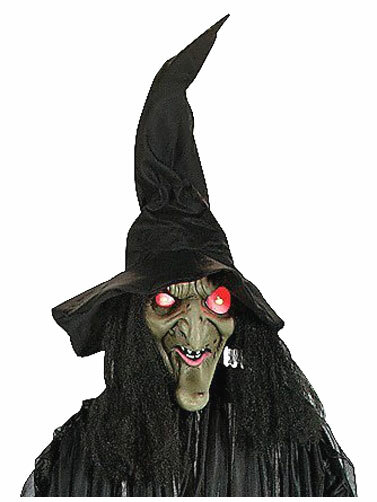 Sound-activated witch is over 7 feet tall, features light-up LED red eyes and makes scary witch sounds. Plastic face and hands with a black fabric dress and hat. Includes plastic stand for displaying. Safe for outdoor displays. Uses 2 AA batteries, not included. Simple assembly required. 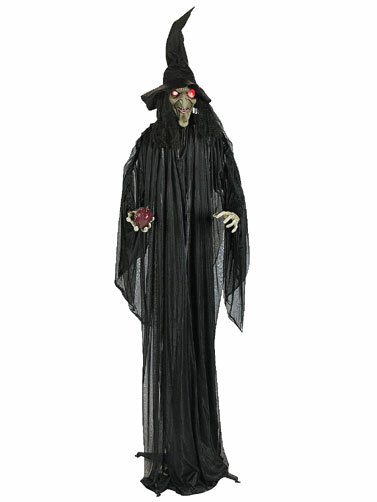 Standing Witch with Red Apple measures 5 ft. 3"W x 7 ft. 9"H.